Balance in our transportation system isn't tough to achieve, but we need to be willing to make these investments and slight changes to the way our city functions. Excitement surrounded the opening last week of the newly-developed West Hamilton bike path from the Main West Fortinos to Chedoke Golf Course. It is a central route that will see many users, especially considering it is lit-up and will be maintained in winter. Much has been written over the years on the Shifting Gears bike plan and the need for Hamilton to get serious about providing safe cycling routes for our citizens. Any city with great cycling networks is a better place to live, work, play and always ends up resulting in stronger neighbourhoods that are more inviting to investors and young families. Here is a simple, affordable plan that requires no road reconstruction, no two-way conversions and minimal investment largely in the form of some neighbourhood speed humps and re-adjusting stop signs. I believe something simple like this could result in cycling participation taking off in Hamilton. Cannon Street from Queen all the way to its eastern terminus has one of its 4 lanes converted into a green, two-way bike lane. Main from Westdale to the Delta: one of its 4-5 lanes converted to a green, two-way bike lane. Wellington Street from Burlington Street to the Mountain Access: one full lane converted to a green, two-way bike lane. Convert the right curb lane all the way up the Claremont Access to West 5th into a green, two-way bike lane right into Mohawk College and the new West 5th hospital. Queen Street from the west harbour to the escarpment: one lane converted to a green, two-way bike lane. Bay Street - two-way bike lanes from Aberdeen Ave to Bayfront Park. Along all of these routes I would suggest we plant lots of street trees, and I believe just this simple plan alone would lead to a massive increase in cycling in Hamilton for work, school, errands and so on. These lanes connect people to where they live, work and play. Right now, virtually no bike lanes connect to the downtown core. Yes, we need to continue the slow, incremental work on the Shifting Gears plan to connect these superhighways to regular bike lanes, but you would see a huge jump in safe cycling in Hamilton and new desirability come back to many of these urban neighbourhoods simply by enacting a plan like this. Take this greenway concept with speed humps, sharrows, yield signs for bikes, and stop signs for cars on the cross-streets, and use it on Central Avenue from London-Reid, Dunsmure from Holton to Reid, Head/Napier from Dundurn-Bay, MacDonald/Herkimer from Aberdeen to James, Queensdale/Brantdale from West 5th to Upper Ottawa, and East 24th/South Bend/Bendamere from Concession (Juravinski) to West 35th (Chedoke Hospital). Now we're connecting entire districts of the city safely and efficiently, and barely putting a dent into vehicle capacity. Notice that all of the streets on which I suggested taking away a lane are one-way streets that operate at a very uncongested, high rate of speed. For those concerned with losing these few lanes on these wide streets, now factor in the huge increase in cyclists using the new superhighways to get to work or school. It is 3 km to Upper James and Fennell and 2 km to James and Burlington Street. How many of our 40,000 downtown workers live within this area? How many Mohawk Students would love to cycle up to the college, but can't safely? Balance isn't tough to achieve, but we need to be willing to make these investments and slight changes to the way our city functions. The status quo should not be an option. It's embarrassing to travel down to Toronto and see speed humps and 40 and 30 km/h speed limits all through their family neighbourhoods, only to return home to wide freeways, narrow sidewalks and no connected cycling routes. A few well-placed bike superhighways, along with some neighbourhood greenways would bring amazing changes to the livability and image of our city. A lot of discussion has surrounded the need for improved transit before the Pan Am Games in 2015. I'm hopeful that by 2015, we will have a top notch bike sharing program like Montreal's Bixi and a plan similar to this proposal implemented so visitors are given yet one more safe, enjoyable way to experience our city and way of life. Nearly all of these involve contra-flow bike-lanes on one-way streets. While that might be doable on, say, the Claremont access (as long as it went to W5 instead of Upper James) since there are no intersections there, it wouldn't be safe on the major 1-way streets. Drivers aren't expecting to see an oncoming cyclist on a 1-way street. The safest thing for a cyclist is to be expected. Put a 1-way bike-lane on Main, Cannon, Wellington, Victoria, Queen North, and King west of Queen - the roads that the city is most die-hard about keeping 1-way. The city's main high-speed corridors. It would put some space between pedestrians and traffic and would provide a bicycle corridor across the city. These are also the streets with the kind of hellishly fast traffic where a cyclist absolutely does not want to be sharing lanes with motor vehicles. I mean, Bond St (for example) doesn't have a bike lane because it doesn't need one to be safe for cyclists. I agree, unless the City is planning on abandoning their one-way corridor mentality, bike lanes will have to "go with the flow." Would the City contemplate using alleys as bike lanes? They are in the core, underutilized and in need of City maintenance. That is a whole other can of worms and costs when it comes to the City taking responsibility for all these alleys but, given how the City is evolving, this might be a good long-term move for the City to think about. Montreal has plenty of 2-way bike paths on one-way streets. Works well, for the most part. I think I read that it costs the city about $1 mil for every new traffic signal. We'd need to add some sort of signal to every single intersection along Main, Cannon, etc. under this plan. That'd hardly be cheap. Don't forget that with the new lanes there would be plenty of signage telling drivers that something unusual is happening. That, along with bike boxes, should make it obvious even to the most oblivious of drivers. Better yet how about a conversion if Cannon into a two way street with bike lanes on each side. Most of our two-way streets could achieve bike lanes like this simply by adding street parking. But Hamilton is addicted to fast-flowing 4 lane streets whether one-way or two-way. We just missed a great opportunity to really enhance the Beasley neighbourhood with the conversion of Wilson. 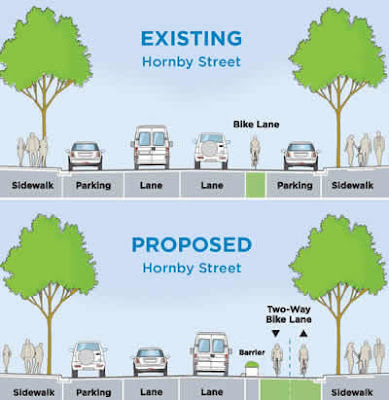 Most of our two-way streets could achieve bike lanes like this simply by adding street parking. This. This would be the simplest way to encourage biking in the city without making it about cyclists. Consistently provide curbside parking throughout the day including rush-hour on all right-hand lanes and slightly widen these right-hand lanes. Then there would be no traffic in the right lane and bikes could do what we always do - use the space between the door-zone and the rightmost actual traffic lane. It's small but somehow it seems to work in many contexts. Dundurn South near Zarkys is a good local example. The space leftover from the parking lane is used for a bike lane. Many cities paint the bike lane instead of just having cyclists use the leftover space...makes it more legit and keeps people more aware. Also, many cities paint small lines perpendicular to the curb so cars park properly. I'm big on the green paint treatment of as many bike lanes as possible. This bike box at Studholme will be a complete bust if its not painted green or have a bike lane connected to it....small details make a big difference. by the way, does anyone know the status of Bixi bike?? I attended the promo event at city hall last year and at the subsequent council meetings we were told that the city was about to sign an agreement with one of the providers (I was told privately that it was Bixi) and we'd see plans develop quickly. Is ANYTHING happening at city hall anymore?? Other than giving Bob Young a whack of money, it seems like the city has grinded to a halt in the past year. King street from Westdale to James - We have lost a lane here already to construction and this has proven that there is no impact to traffic. WHat better way to try to bridge the gap between McMaster and the core than by putting a proper bikeway link. Regarding two way bike lanes on one way streets: 1. This is the easiest way to make cycling directly to a destination easier. Detours that are inconvenient for cars becomes doubly so for cyclists when your destination is not favourably located in terms of the one-ways. We need more contra flow bike lanes (king william comes immediately to mind) 2. WIth proper signals, the danger could be greatly reduced if not eliminated. As Kenneth said above, just take a quick boot around Montreal to see how it could work. On a major one-way artery, the bikeway would be physically separated, and at intersections, the cyclists would have their own signal. Turns on red could be prohibited when entering or leaving a bikeway street. I should also add to the list, Charlton Ave between Wentworth and its' western terminus. A bike lane could be painted there overnight without disrupting traffic flow. The only live lane I can see being eliminated is the narrow one that nobody uses between James and Bay. Otherwise, bike lanes fit perfectly on both the two-way and one-way stretches. The biggest concern I have about bike lanes is the potential to segregate road use. We have to be careful not to make bikes less common and accepted on normal roadways. I'm not particularly fearful of riding in traffic, and I suspect most 12kph bike lane user don't want to deal with me whizzing by at 40kph. I'm not against bikeways in any sense (Vancouver's are amazing, as are Montreal's), but there's a bigger issue, and that's the ability to ride on actual roads. One winter I had a bus driver start honking madly and screaming at me for riding in a lane of traffic on the King Street bridge, despite the fact the bike lanes were snowed in, un-plowed and pretty much impassable. That, and the other thousand or so stories I could tell of abusive, aggressive and dangerous behaviour by drivers suggests we have a long way to go. I don't think it's possible for bikes to be much less common and accepted on normal roadways. The simple fact is that most people, most of the time, will not ride bikes in mixed traffic. The only way to get large numbers of people to ride bikes is to established dedicated space for cycling. Getting large numbers of people onto bicycles will do more to normalize cycling for motorists than anything else. I admire the courage of people who cycle on bad snow and icy roads. I certainly don't have the gumption to do so and probably never will, hopefully that is. I admire the courage of people who cycle on bad snow and icy roads. The thing is, snowy, icy roads are pretty rare: the main arteries go from snowy to wet to dry within a day of a big snowfall, for the most part. Last winter, there were only three days when the roads were not clear enough to ride on wet or dry pavement - and that was a snow winter. Okay, I admire the courage of people who cycle in bone-chilling cold wind. Ok - well, that's harder to disagree with. But, seriously, it's not a big deal. I wear the same things when I ride my bike in winter as when I walk, with the qualification that I put on a toque or fur hat more readily - on account of the wind. A 50km ride at full tilt in Winter while wearing spandex? That's a feat for the hardy. A 2km ride to the grocery store? That just means a extra button or two done up and an extra wrap of the scarf. I'd add that when I was cycling, I started wearing gloves earlier in the cold season than I do when walking. Otherwise, I found that I'd warm up very quickly when riding and usually had to unzip my coat a bit before arriving at my destination. I ride a fair bit -- 90 to 210 km per week. THis plan has a lot of flaws. I'm concerned that this type of plan will become a secondary motorized vehicle system, taken over by Vespa style electric bicycles, and 49cc gasoline powered scooters, both of which I believe should be treated as motorcycles. While the e-bike might sound good, the realities of battery manufacture, disposal and charging completely negate any perceived benefits. There is a great deal of overly positive speculation here too, such as "How many Mohawk Students would love to cycle up to the college, but can't safely? ", that's laughable. The status quo is very acceptable, in that all lanes are bike lanes. Cyclists need to learn and obey the rules of the road and get into traffic when required. If you can't make a left turn from one multi-lane street to another, you shouldn't be on that street on you bike, any more than someone driving a car should be there without that skill. Can I jump onto the road paralell to the bike lane when it's clogged with slow-moving skateboarders and kids with training wheels, roller bladers, etc.? I think This plan will have drivers believing that bikes belong in bike lanes, and that will eventually become the law based on the ifrastucture investment Mr. Leach describes, which will screw those who really do use their bikes substantially. I ride myself and have 6 young children and this is not something I would support my tax dollars going to. All Lanes are bike lanes. Just obey traffic laws and ride your bike. Mark, I urge you to head to Montreal for a few days and grab a bixi. Once you see what separated bike lanes can do for you as a cyclist on the major arteries, you'll wonder why we don't have them everywhere. While legally, cyclists have full right to an entire lane, the reality is that on busy arteries, motorists do take every opportunity to squeeze as much lane space as they can. This means that a high level of confidence is required on the cyclist's part. Separated lanes will get more people on bikes and as their confidence builds they will become more comfortable on streets without lanes. In this way, the "superhighways" can be seen as stepping stools to greater cyclist skill as well as acceptance by motorists as bikes become more prominent. The status quo is very acceptable, in that all lanes are bike lanes. Montreal, Paris and New York are among the bike-unfriendly cities which have in recent years become bike-friendly and more bike-intensive after installing dedicated bike lanes. What Mr. Harrington says sounds reasonable, but it flies in the face of all evidence. I like the idea of dedicated bike lanes on underused arterial roads, but I'm strongly opposed to the author's suggestion to have two-way bike traffic on one-way streets. Bikes should be subject to all of the same conventions and restriction as cars -- it's safer for everyone. "show me an example but the example we have doesn't count"? The 403 bridge is a two way bike lane on a one way street (which also has highway ramps which SHOULD be intersections but that's another discussion), so it does count. Markland has a contraflow lane for much of its length. The Main street 403 bridge is supposed to be getting a multi use path (presumably two-way) when it is complete. And in other major Canadian cities, two way bike lanes exist on one-way streets. It is not a new concept. Interactions at intersections are no more dangerous and can actually be improved over same-direction bike lanes with proper signalling. It all comes down to designing the intersections properly. Eliminating turns on reds and adding cycle-specific red lights will give cars the opportunity to turn across the lane safely and would eliminate people turning onto the street from failing to check in the "wrong" direction for bikes. 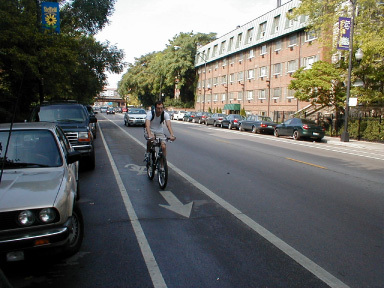 A separated lane is a very clear part of the road and it is less likely to be overlooked by motorists than the standard painted bike lane. The problem with the contraflow lanes happens at intersections. And in fact the problem with any bike lane happens at intersections: ambiguity sets in for both cyclists and motorists, and there is the additional problem of unexpected traffic to the right when one is going to turn (one's car) right. That said - distinct and especially separated bike lanes lead to more cyclists on the roads: it's not a matter of reasonable or unreasonable, it's a matter of experiential fact. We can - and we do - argue about which kinds of bike lanes if any are best or safest or fastest, but I'll take almost any kind of bike lanes since they get more people out on bikes. And more people on bikes makes for a better city. Markland's contra-flow bike lane has been in operation for years. It sees a surprising amount of traffic these days. There have been some problems, but mostly with cars who don't realise the stop signs are bicycle-specific and end up driving the wrong way up the street. I also have to (again) echo the concerns of Mr Harrington - bike lanes can be a very effective means of getting more bikes on the road, but they aren't the only one and it can be risky to focus too much on one measure in isolation. The new lanes on York are a good example - they're very narrow and have no physical separation, so they end up feeling much less safe than before. Many times, especially in suburban areas, I can't tell if there's a bike lane or just a white line marking the gutters/shoulder. People aren't afraid to cycle because of a lack of bike lanes, it's because of the Mad-Max-esque state of our roads. This isn't just about perception, as one commenter noted on here at the time, even the Bixi representatives got screamed at while giving a presentation in front of our City Hall. Why, as mentioned in a recent thread, might a mother not want to commute across town on a bike? A sad state of affairs, but not hard to understand. A well-designed network of bike lanes helps a lot - the King Street Bridge lanes, for all their flaws, have done a lot of good. Still, the city needs to firmly establish that cyclists have a right to be on all roads. Wow,what a great concept! This is a project most can see as a valued added service for our City! The Future Fund could be used to expand bike lanes rather than a Veldrome that serves so few! I was driving along Barton Street in the area between James and Wentworth today and had this thread in mind. For the East-West bike lane, why not just add a bike lane to Barton in the curb lane in each direction. Most of the right lane seems to be wide enough for onstreet parking and a bike lane. This option would be cost effective, there would be a minimal impact on traffic and parking and would offer a safe (safer than some of the other suggestions) route. The only cost would be removing several "bumpouts" that occur in one of the stretches. The lane even looks wide enough to have the bike lane closest to the curb, and the street parking between the bike lane and the car traffic/lane. This would improve the cycler safety by lessening the chances of car/bike collision and reduce the chances of a biker getting hit by the opening of a car door. In general, I love biking on Barton. It's quieter and much more interesting than any other major east/west artery in the lower city. I have to agree with SpaceMonkey about those bump-outs though, they add a lot of unnecessary complication to riding in the curb lane. There has to be a happy medium between their traffic-calming abilities and being able to ride a bike in that lane - even 10-12 inches would do a lot.